How big does the pot need to be for root system on a full grown sago? 18 inches tall and 18 inches across is the size I have my sago in now. Can it be in a smaller one? They don't seem to be very long. Has the plant been in this pot size for quite some time? It would be unusual for a plant to go down a pot size if the plant has been doing well, or it has began to outgrow the existing pot. It's important that the plant have good potting soil with proper drainage. 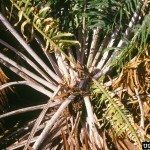 Here is a link to proper care of a Sago Palm.